A Perennial Conference Photographed with a Different Model and Brand of Camera Every Year for Nine Years. Every year (except one) in the last nine years I have been hired to photographically document a very unique corporate conference that takes place here in Austin. It's unique because attendance is by invitation only, it's closed to the press and the public, and it's pure sophisticated social+economic content. The invited attendees come from banking, investment, demographic research and governmental agencies. The speakers include billionaires, thought leaders and best selling authors. The subject matter involves finance, new investment paradigms, demographic trends, global financial trends and new industry creation. The actual content is protected by NDA. But none of that is really important here. What I want to talk about is how I photographed the show this year, or, more to the point, what cameras I used this year. I opted to use two Panasonic GH5s and two Olympus lenses; the 12-100mm f4.0 Pro and the 40-150mm f2.8 Pro. This year I was able to forego bringing along a wider assortment of lenses because the two Olympus lenses covered every thing I needed, from wide stage shots to tight shots of speakers on stage. The robust image stabilization supplied by the 12-100mm (in lens) and the GH5 for the 40-150mm (in camera) meant that this was the first year I could drop any tripod or monopod from the gear inventory and not miss it in some situation or another. The system checked all the right boxes for the way I photograph these kinds of conferences. The conference doesn't want me to use flash in during panels or speeches. The system needs to be good enough to operate at ISO 800 or higher without issues so that flash is always unnecessary during "main tent" sessions. Since the show is fairly intimate, with only 250 attendees, and since I work fairly close to the stage, the camera needs to be very quiet or altogether silent. Since I move around a bit during presentations the cameras have to be light and mobile. Distilling down to 2 mirrorless bodies and two lenses is a major plus. So far I've done previous shows for this client with: 4/3 Olympus cameras, Nikon APS-C cameras, Nikon FF cameras, Canon FF cameras, Olympus m4/3 cameras, Panasonic GH4 cameras, Sony FE cameras, Sony RX10 cameras and now the Panasonic GH5s. With each system (except the RX10s) I tried to source the smallest number of lenses to cover wide shots of the main ballroom in which the conference was held all the way down to tight head shots of the speakers on stage. In terms of convenience the RX10iii was without peer. But it took tight control to stay right in the small zone of best compromise where subject motion didn't become an issue but neither did noise in the image files. Sometimes I was successful and sometimes not. Underexposed high ISO one inch sensor files can get a bit ugly in post. Overall the Sony A7Rii had the best image quality to date but was not my favorite for handling and daylong comfortable operation. The lowest image quality came from the earliest cameras; the 12 megapixel e-3 and e-5 Olympus 4/3 cameras. 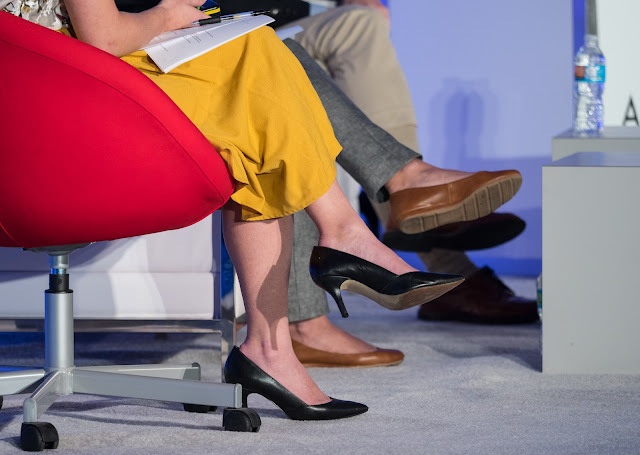 The worst fit for conferences came from cameras like the Canon 5Dii the Nikon D750 and D700. These were far too loud for any situation which called for a discreet, quiet approach, even when wrapped with neoprene. The shutters and mirrors, even in quiet modes, were just too loud to allow me to sit in the audience and work. This routinely limited the number and kind of shots I could take. Last year I split the show between the A7rii and the RX10iii. My primary lens on the A7Rii was the 70-200mm f4.0 G series lens. I also used a battery grip on the bottom of the A7Rii to provide longer battery life. The combination became uncomfortable to hold and use during a full eight hours of on again, off again handheld photography. In addition, the A7Rii and A7ii electronic viewfinders didn't track as closely, in terms of color and exposure, as I hoped they would with my studio computer. Finally, it was burdensome to use them in their raw modes because of the enormous size of the resulting files; even with the 24 megapixel A7ii. The 42 megapixel file sizes of the A7Rii pushed me to use that camera as a Jpeg-centric tool since we ended up with nearly 3,400 files by the end of last year's show. The RX10iii was very convenient and easy to work with over the course of a long day but the files sat right on the edge of the pass/fail edge of image quality in dim situations at ISO 800+. I decided to test the GH5 in the conference arena by using two of them at this show. I'd done a series of tests leading up to the show so I was pretty confident that they would be adequate to the task. I also knew from testing that the two lenses I chose would be very sharp. They would not be the weak link in the imaging chain. (That would be me....). The GH5 checked all the right boxes for me. The EVF finder is the best I've owned so far. The camera's shutter is quiet enough to use in its mechanical setting with EFC but has a full-on silent setting if needed. The battery life, with review turned off, was excellent. I shot all day yesterday with one battery in each camera and no need to change. Yes, all day on location with the original two batteries. The image in the EVF tracked the reality of my calibrated computer screen much better than any previous camera I've used and the 12 bit raw files are small enough to allow me to shoot (for the first time) the entire show in a raw file format which allowed for much tighter color correction in post. I was able to use zebras to consistently get bright exposures without blowing out caucasian skin which also helped keep noise to a minimum. This year the stage set consisted of white leather couches and a center white desk so I had ample targets, in changing light, from which to set custom white balances. I maintained three custom white balances in three saved banks and was able to move through those presets quickly as the light on the stage cycled. Having the right color balance and the right exposure means minimal noise in these cameras at ISO 800. Getting it right in camera meant I had less need to boost shadows in post, which is what usually makes noise rears its ugly head. A quick note about iPhone software for the GH5 camera. One of the speakers pulled me aside before he went on stage and requested that I get some great shots of him on stage and also asked if I could send them to his company's marketing team by end of day for use on social media. I assured him we could do that and then downloaded the Lumix phone app. It took me about ten minutes to set up a wi-fi network between the camera and phone (while continuing to photograph) and after that I started grabbing selected frames of the guy speaking and transferring them to the phone. When I knew I had a dozen good shots (all Jpegs) I sent them via e-mail to the exec's e-mail address and the e-mail address he'd given me for his social media team. The social media people had the images ready for upload before the speaker left the stage. They were just waiting for final approval as the behind-the-curtain production crew retrieved his lav microphone and body pack. But let's get down to the stars of this particular documentation exercise: The Olympus Pro lenses. I'll go out on a limb here and say that I think the 40-150mm f2.8 Pro lens is the sharpest lens I've ever shot with from any maker, including Leica. I shot with it only at its wide open aperture setting and was amazed at the sharpness, contrast and detail in the final files. It may be that full frame cameras have advantages with their sensors but these lenses go a long way toward equalizing the playing field. The 40-150 is easy to handhold, the manual focus system (with hard stops at close focus and infinity) is elegant, and the performance in the final files is stunning. I'm in love. The second lens is one I've already gushed over. It's the 12-100mm f4.0 Pro. While I'll always wish every lens was one stop faster the lens is so nice to use that I know I'll get over that mental block. I was able to shoot about 80 % of the material over the last three days with this lens since it covers such a wide range and does so very well. This system is the best compromise across all the systems I've used for this kind of event and stage work. I can hardly wait to use it at the next theater dress rehearsal shoot. The lenses are just right in terms of range and (especially with the 40-150mm) speed. The camera is very surefooted when it comes to the S-AF focusing that I normally use and the handling of the body and body+lens is perfect. We get our first big video trial for a client on Tues. but the tests I've already done in studio have been so exemplary where video is involved that I have not doubts about the technical tour de force kit we'll have on hand for our CEO interview. The only thing I worry about now are my own skills at interviewing and operating all the moving parts correctly. 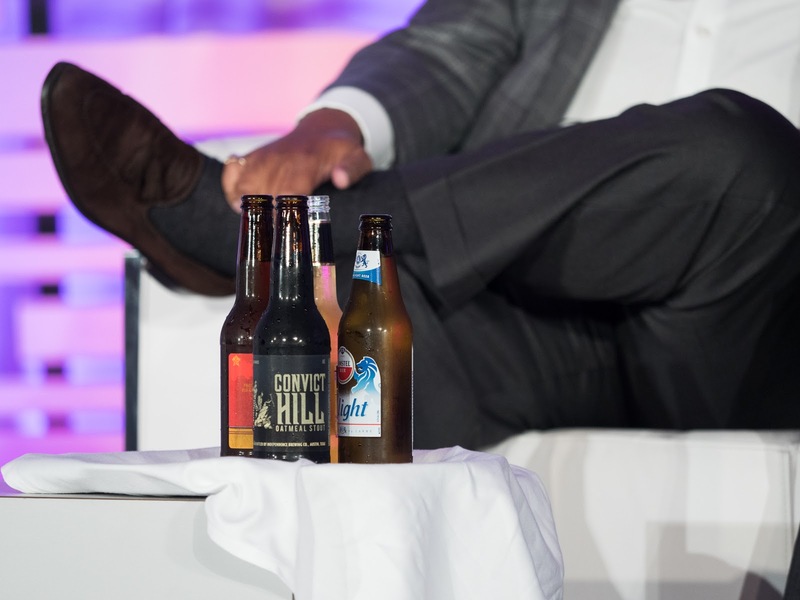 Photo below: During the last panel discussion on the first full day of the program the show producers send out a selection of beers to all the attendees and all the panelists. We drink a toast before the last panel begins. Sometimes they change up the tradition and waiters come out with Champagne. It's a very civilized show indeed.